The 3-phase AC output line reactor material has copper and aluminum for choice. It is used at rated current of 7A, for vfd. The insulation rank is class F,H, voltage choose from 220V, 380V, 400V, 410V, 440V, 460V or 480V. Low cost, well-made and widely used. The 10 hp (7.5 kW) AC output line reactor at a comfartable price, with rated current 20A, 3 phase for vfd, usually work voltage is 380V, you can also choose 220V, 410V, 440V,460V, or 480V, carrier frequency is 2-8khz. Low cost 100 hp (75 kW) output line reactor with rated current 200A, 3 phase, selectable voltages 220V, 380V, 400V, 410V, 440V, 460V or 480V, carrier frequency of 2-8 KHz. It's reliable and economical. Excellent 15 hp (11 kW) AC output line reactor is designed with copper or aluminum, 3 pole for VFD, voltage with 220V, 380V, 400V, 410V, 440V, 460V or 480V, Inductance Value is 0.23 mh. Preferential price, direct sale by manufacturer. 3-phase line output reactor with super high performance, 150 hp or 110kW. 220V, 380V, 400V, 410V, 440V, 460V or 480V voltages, rated current 250 amps, copper or aluminum for selection, attractive appearance, low noise, high protection class and durability. Low price and directly selling by manufacturer. 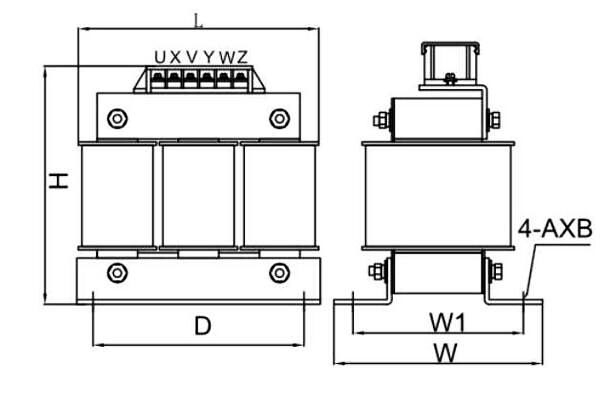 3 hp 3-phase reactor are available for 220V, 380V, 400V, 410V,440V, 460V or 480V, with rate current 7A. The working frequency is 50/60Hz, reasonable price, long service life and high reliablity. Tips: How to select a line reactor? The line reactor is the general name of the inductor and the reactance device. As inductor appeared earlier on the history of electrical equipment and was called line reactor, capacitor is also called reactance device. 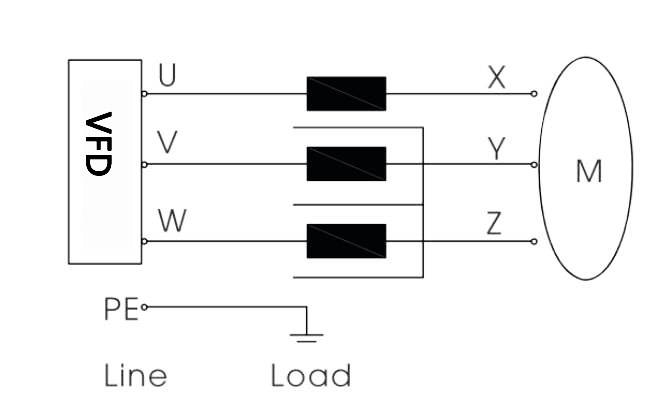 Common line reactors include the incoming line reactor, which is used to restrict the sudden voltage change and current impact caused by overvoltage. It can also smooth the spike pulse contained in the power supply voltage, thus improving power quality. Single phase DC line reactor is mainly used between the DC link and contravariant link in the inverter system, its main function is to limit the AC component superimposed on the DC current to a specified value. Main function of three-phase output line reactor is to compensate the influence of long line distributed capacitance, restrict the output of harmonic current and improve output high frequency impedance, thus protecting the inverter. Common line reactors include the core-type line reactor. Such a line reactor has small size and low magnetic flux leakage, loss. It can be used in the high-voltage board. However, it also has many disadvantages, such as large noise, easy magnetic saturation (which may lead to burn out of coil), poor harmonic suppression and poor short circuit current resistant. Dry-type air core reactor has strong flow capacity, simple but tough mechanical structure, it can be used outside. However, it has disadvantages of high active power loss and large electromagnetic interference to surrounding electrical equipment . Moreover, half core-type reactor and magnetic shielding reactor are also common. Therefore, the converter has many types and functions, proper line reactors shall be selected by demands in actual power systems. 3 hp output line reactor is as stated and working very well! The shipment arrived on time undamaged. The best price for the quality, it tooks me a long time to find what I wanted here.